Visiting Cornwall – Wondering What to Pack? If you are planning a visit to Cornwall, you may be wondering what to bring with you. What will the weather be like and how to be prepared for it? 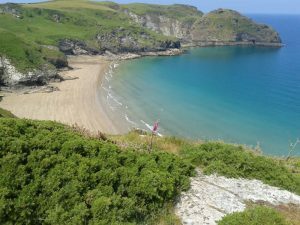 Living here for the last 11 years and running a tour company for about 7 years, I now have a lot of experience of trying to be prepared for the great British weather – with a Cornish twist. The weather forecast will give you a clue, but don’t rely on it. On the North coast we seem to get a variety of weather systems moving in from the Atlantic, and so we can go from warm sunshine to hail-stones within minutes. The high ground on Bodmin Moor also has an influence. Cornwall is a peninsular. Local lore says moving between coasts can help you to avoid bad weather; if it’s wet on one coast there maybe sunshine elsewhere. Footwear is perhaps the most important consideration, especially if you are planning to come on a tour with me. 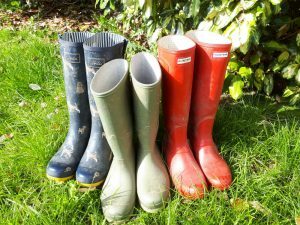 Wellington boots are useful in wet weather and if we are not walking too far. But they don’t give any ankle support and are quite hard on the feet. They can rub and cause blisters too. So perhaps two pairs of socks are advisable. I’ve seen people quite happy walking around Tintagel Castle in wellies, but I think walking boots are a better option. Fabric based are lighter, often cheaper, but need regular treatment with a waterproof spray. Trainers or sneakers can be very comfortable and practical for short distances on dry days, but they are not ideal for walking on Bodmin Moor. 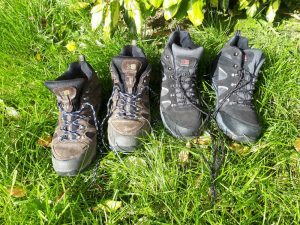 If you are concerned about packing boots, you can always wear them to travel in? Just tell them at the airport you are going on Safari. We do get very nice hot sunny weather. Head for the beach! You know what to wear there. Cornwall is full of beautiful sandy beaches. Be aware that the tide can move very fast and there are broad changes in conditions. The main way that this affects your clothing is when you return from a swim – to find the tide has come in and all your once dry possessions are floating about in the sea. If you are coming on a tour with me, bring sunglasses and sun-cream and maybe a hat. You will burn in the Cornish sun and if there is a breeze you may not feel it until it’s too late. It is a good idea to dress in layers, keeping a warm spare layer with you. A backpack is useful. c You are a struggling artist drawn to Cornwall by the beautiful light and the atmospheric vibe. Paint on your clothing is a lifestyle choice. Idealized Cornish style is the brand Seasalt, I own several of their stripey tops, OK lots of them. Finally, it’s a good idea to have a waterproof top layer. If you are coming on a tour with me and don’t have a rain-coat, let me know. I bought a set of spare coats and nylon over-trousers when I started the tour business. Some of them are still quite waterproof and I’ll dig one out for you . 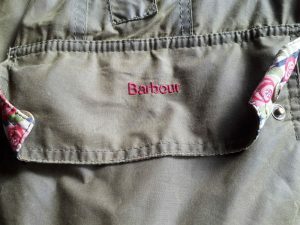 I love my own Barbour coats too. If you feel like splashing out, no pun intended, it’s a very British country brand.